This mound, in Valley Forge Historic National Park, is actually an oven. It is like the ones used for baking bread by the bakers of George Washington's army. Christopher Ludwick was in charge of all of the bakers in the army. 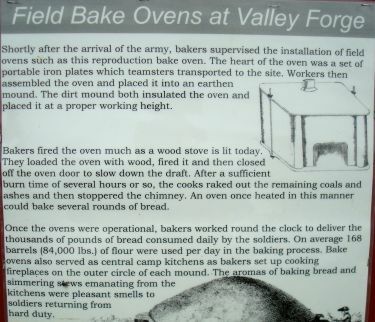 This sign, posted at Valley Forge Historic National Park, explains how the ovens were made and used. Christopher Ludwick was born in the town of Griessen in Germany on October 17, 1720. His father was a baker. He taught Christopher to be a baker too. When Christopher was 14 years old, he went to a free school. He learned to read, write, and work with numbers. He also learned about the Lutheran faith. Christopher joined the Austrian Army when he was 17. He was a private. He fought in the war against Turkey from 1737 to 1740. When the war was over, Christopher was in a group of 100 soldiers. They were a long way from home. The men had to march home across cold, empty land. 75 of the men died on the way. Christopher lived to reach Vienna. He stayed in Vienna for a short time, and then went to Prague. While he was there, the French army surrounded the town. They kept the people captive for 17 weeks. Then the town surrendered. Christopher joined the Prussian army. Christopher grew tired of being a soldier. He went to London. He became a baker for the ship The Duke of Cumberland. The ship sailed to many ports. The voyage was over in 1745. Christopher was paid his wages. He earned 111 guineas and 1 English crown. Christopher wanted to see his father again. He went back to his hometown. He learned that his father had died. His father left all that he had to Christopher. Christopher sold his father’s estate for 500 guilders. He went back to London. Christopher decided to have a good time. He spent all of his money. When his money was all gone, Christopher became a sailor. He saved the money he earned on this trip. Christopher had 25 English pounds. He bought some clothing with his money. He sailed to Philadelphia. He sold the clothes at a profit of 300%. Then he went back to London. He studied baking, and learned how to bake gingerbread and other good things. Christopher married Catharine England in 1755. They had one child, but the child died. Christopher was a baker for over 20 years. He saved his money. He bought some houses. By 1774 he owned a farm, 9 houses, and had quite a lot of money. In 1774 everyone was talking about going to war with England. There were meetings and committees. Christopher was elected to go to every convention in Pennsylvania. At one convention Governor Mifflin asked for money to buy guns. Many people thought that no one would give money. Christopher Ludwick gave 200 pounds. Christopher joined the Continental Army. He volunteered his time. He did not take any pay or any food. He helped the soldiers to keep their spirits up. He told them about life in his old country. He reminded them that freedom was important. Christopher spoke German. The British army had many hired soldiers. They were called Hessians. They came from the same part of Germany as Christopher. They spoke the same language. Sometimes Christopher would sneak into their camp. He would pretend to be a deserter. He would tell the Hessians how good life was for the Germans in Pennsylvania. He would convince them to run away from the British army. The British never caught him. Christopher was also a good interpreter. He would help question the Hessian prisoners. For a while the war did not go well. George Washington lost the battles at Brandywine and Germantown. He took his soldiers to Valley Forge. There was not much food. The bread was not good. General Washington asked for one man to be in charge of baking the bread for the army. This man was Christopher Ludwick. Congress made him the Superintendent of Bakers. Christopher had to work hard. He went to the camps. He looked for men who could be good bakers. He taught them how to bake bread. He was in charge of their work. Some bakers had cheated the army. Congress told Christopher that for every 100 pounds of flour, his bakers must make 100 pounds of bread. Christopher Ludwick refused. He explained that water and yeast are added to bread. This makes it weigh more. He said that for every 100 pounds of flour, his bakers would make 135 pounds of bread. He did not want to cheat the army. At the end of the war General Cornwallis surrendered to General Washington. This meant that there were many English prisoners. They all needed to be fed. George Washington ordered Christopher to bake six thousand pounds of bread. His bakers did it. Christopher Ludwick was a tall man. He always stood very straight, like a soldier. One of his eyes was lost in an accident during the war. George Washington liked Christopher Ludwick. He called him “his honest friend.” Christopher Ludwick had a quick temper, but it did not last long. He was good at telling stories. He could make people laugh. He loved his country very much. When the war ended, Christopher went back to his farm. The British soldiers had been there. They had stolen everything. Christopher did not have much money. He had given a lot of money to help with the war. He had been paid in paper money. This money was not worth much. Christopher did without. He slept between blankets because he had no money for sheets. After a while he sold some land. Then he had money for clothes and furniture. George Washington knew that Christopher had done a lot to help the new country. He wrote a note saying that Christopher was a good man. Christopher was proud of this note. He hung it on his parlor wall. Catharine Ludwick died in 1795. Christopher sold most of his property. He kept one house. He put his money into bonds and stocks. He moved from his farm. He rented a room from Frederick Fraley, a baker. Christopher kept on doing kind things for people. He would find out which people were in need. He would help them in secret. No one knows all of the good things he did. We do know that he paid for the freedom of three African slaves. He paid for over 50 people to go to school. During the yellow fever epidemic in 1797, many people left Philadelphia. Christopher stayed. He helped bake bread in Frederick Fraley’s bakery to give to poor people. After the epidemic was over, Christopher moved into his house at 176 North Fifth St. He married Mrs. Sophia Binder in 1798. At the end of his life Christopher Ludwick was often sick. He stayed in bed. His wife read to him. When he felt better, he would visit his friends. He read his Bible and other religious books. On Monday, June 15, 1801, Christopher became very ill. He had a high fever. He died on Wednesday, June 17. He was 80 years old. He was buried in the Lutheran Churchyard in Germantown. Christopher left behind a generous will. He left money to family members. He left money to educate poor children. He also left money to help people who were poor and sick. He left a large amount of money to start a school for poor children. His will said that the school must be started in five years. The Christopher Ludwick Foundation is still at work. Every year it gives money for the education of children in Philadelphia.